Visitors to airports have many words for their restrooms; some polite and some not so much so. From water closet to loo to privy to john to whatever, few mince words when bathrooms are poorly designed, not maintained and/or worse, are filled with pungent nasty odors. Somehow, improvements in many airport restrooms have fallen by the wayside as other technological advances have absorbed the creative talents of airport landscape architects and designers, and while some airlines have picked up the ball, many have fallen behind. So how do those that oversee airport operations, safety and environmental sustainability improve their public restroom experiences? There are actually many options available, but one of the most important has to do with controlling the nasty odors that often develop in commercial washrooms and the implementation of professional air freshening machines that aid in transforming an otherwise unpleasant experience into a healthier, cleaner and fresh-smelling one. This article delves into the history of the airport user experience, the importance of airport restroom hygiene, why airport restroom sanitation is often overlooked and an overview of the professional, cost-effective Air-Scent solutions used in washrooms of business throughout the world to help aid in commercial odor neutralization and enhanced, fresh-smelling air. Over the years, customer service and satisfaction have become an important focus to airport designers and operators. In addition to airport security, which was virtually non-existent until the 1970s, terminal entertainment, facilities and amenities, such as restrooms, have evolved to the point where in many cases they have actually become works of art. Ultimately this may well lead to passengers choosing their airport as much or even more than they would choose a specific airline. The passenger experience, including the use of restrooms, has also been greatly enhanced by emerging technologies. With restroom use comes the ongoing need for premium maintenance and ambient scent care. Airport cleaning staff cannot do this effectively without some outside help such as that offered by the scenting masters at Air-Scent, who know how to use fragrance to create a favorable and lasting first impression for airport travelers. Minneapolis-St Paul International Airport won a national award in 2016 for its many restroom advances. Boeing engineers and designers created an airplane lavatory that cleans itself with ultra-violet lights and restrooms that display flight information and doors that swing open automatically. They also feature original Minnesota mosaic artwork executed by regional artists. Airport development is reflecting more and more an awareness of sustainable design, construction and operations that far exceeds governmental compliance with reducing carbon emissions. The current trend is to maximize the passenger experience and the advantages of long-term cost savings by implementing sustainable design technologies. Many airports throughout the world are striving to achieve a much lighter carbon footprint within both their existing and planned infrastructure expansion. These initiatives have slowly but surely altered public perception of the aviation industry as being the worst polluter of our planet. Throughout the industry’s evolution, knowledge about its impact on the environment has evolved, but it has never been more clearly understood at any other time in its colorful history. Why Are Some Airport Restrooms So Often Neglected? The key role of airports has remained unchanged over the years. It centers around one simple question: How can we get our passengers from here to wherever there is quickly and safely? While this goal is still paramount, air travel has morphed into a more complex, inclusive, high-tech user experience that includes amenities, pleasure, comfort and convenience. Priorities have shifted in the development of the flying experience over the course of the last few decades almost imperceptibly, like sand sifting through an hourglass. The problem is that many airports have responded positively to the changing needs of passenger comfort by expanding costly amenities, but in doing so, have neglected their restrooms, many of which remain aesthetically fixed in another time and place. Airport bathrooms reflect both the first and the last impression a passenger retains about the city they are visiting. This is due largely to the fact that restrooms represent one of a handful of amenities airports actually provide for their guests. According to Terry Slaybaugh, manager of Dayton International Airport: “Air travel has become such a challenge for the flying public. With the capacity game that airlines are forced to play, aircraft are packed. Airport restroom users while almost certainly in a rush for time, still decide within the blink of an eye whether or not they want to venture further inside the bathroom, and malodors are an enormous turn-off. Potential clients need a positive reaction or everything in front of them is a colossal waste of time and energy. Perception is reality when it comes to the restroom experience in airports. Many older facilities use dark materials for the walls and flooring. Some darker substances are fine but when the whole restroom is very dark or even black, as it is at the Beijing Terminal 2, the mood when visiting the restroom can be gloomy and even ominous. Passengers know that darker colors disguise water and dirt, and may assume that the restroom is dirty even when it isn’t because they cannot actually see that the bathroom is clean. Passengers may also incorrectly assume that an airport bathroom is dirty due to the fact that materials age, crack and sometimes discolor. This is the reason many airlines go that extra mile and purchase the best quality materials possible. They also use the master ambient air care specialists at Air-Scent, who are the best professionals to call when the time comes to maintain clean, fresh smelling restrooms that will satisfy even the most particular passenger. Airports all over the world are plagued with the same basic dilemma; namely, having enough washrooms in strategic places and keeping them clean, inviting and smelling fresh. There is no doubt that poor toilet user experiences are strongly linked to passengers’ dissatisfaction with an airline. Some airports have tried to brighten up their restroom entrances and interiors with nice touches, such as flowers found near the sinks at George Airport in South Africa or murals created at an airport in Jacksonville, Florida, suggesting users will be in the clouds during their sojourn. Restroom developers in Mumbai have combined their history and culture by creating stylized men/women drawings to represent the washroom. These flourishes are both fascinating and clever and can transform older restrooms into more personal facilities, but an overall airport restroom experience will never be improved if the user walks away with the feeling that the toilet is dirty and foul-smelling. We’ve written extensively on the subject of maintaining clean fresh-smelling washrooms, as well as addressing the route causes of restroom-borne malodors and we’re not the only experts underscoring the importance of each. According to Charles Gerba, a microbiology professor at the University of Arizona who is an expert on the prevalence of bacteria on common surfaces, “Within one hour, adults touch their face 15.5 times, their eyes 2.5 times, their noses five times and their lips eight times on average. The easiest way to catch something is to touch a surface that’s been colonized with bacteria, and then touch your face…An airport toilet is probably the “germiest” toilet you’ll come across.” This why superior molecular odor control and bacteria fighting products, such as Metazene provided by Air-Scent, are vital to airport bathroom maintenance. Professor Gerba recently collected bacteria from twenty airplanes to find the most infected spots. Airplane bathrooms won by a landslide, most seeing fifty people between cleanings, and some as many as seventy-five! The very nature of an airport with its large crowds from all over the world constantly converging in confined spaces, turn-around flights with little time to clean planes in between departures and closet-sized bathrooms, all lend themselves to a non-hygienic haven for bacterial colonization and foul malodors. Airport restrooms are a treasure trove of psychological revelations to those who know how to look for them. This is because we perform rituals there that are usually conducted in the privacy of our homes. It is the place where we all prepare for our daily interaction with the world at large and reveal to all who care to see our emphasis on personal appearance and our relationship to hygiene and our bodies. Airport restrooms are unique commercial spaces in more ways than one. They are both public and private at the same time, and they are usually the first place passengers visit when arriving at an airport and the last stop before departing. They are also part of another transient dimension that lies somewhere between the past and the future. Such odd distinctions would seem to merit special attention paid to airport facilities, but this is not the case in many instances. The only constancy found in an airport environment is the element of change. The frenetic rush of strangers impacting strangers as they rush to board silver planes destined for far away places creates a one-of-a-kind ambiance. Coping with long lines, lost luggage, crying children and adults, and missed connections brings out the worst in travelers, stretching their patience and challenging their usually somewhat well hidden, politically incorrect aggressions. Ongoing maintenance is a top priority for airport restroom designers, especially when considering the use of new fresh materials. One major change involved switching from stainless steel toilet partitions to panels made of recycled paper and petroleum-fee resin. These materials are easier to clean and maintain. The selection of large ceramic tile with thin grout lines minimizes the accumulation of dust and grime and terrazzo flooring (mosaic made from ground marble) adds to a clean and polished look that is easy to preserve. Around 2.3 billion people fly every year and many of these passengers have smart phones and could greatly benefit from apps specifically designed for airport travel. New mobile technologies permit a more personalized approach. For example, one airport restroom app allows passengers to conveniently discover which bathrooms are in the process of being cleaned and which are available to avoid wasting time and unnecessary steps, which can be very convenient when laden with luggage. At Houston’s George Bush Intercontinental and William P. Hobby airports, travelers can now use touch pads to send immediate feedback on their restroom experiences. Installed outside of restroom entrances, the ‘smart’ system requests users to rate their restroom visits with happy or sad faced emoticons. The latter requests further clarification involving a choice of options that range from: a lack of toilet paper, wet floors, dirty stalls etc. The information is passed along and when the ‘passenger threshold’ is met, the custodial staff embarks on a thorough cleaning, which includes the application of the finest environmental odor control and air freshening products and services provided by Air-Scent. This is a bit pricey at about $5, but most agree it is worth it because of the detailed information it can provide about flight status, parking rates, layovers, and services and amenities including restrooms for more than 700 airports from all over the globe. This app is free and can provide within seconds information on shops, restaurants, restrooms and other amenities at both domestic and international airports. It boasts solid associations with airport management companies from all over the world, which enables them to provide passengers with information that is accurate and up-to-date. This app also has some fun features relating to flight-related statistics. This free app has an official website that lists reviews and other information on nearby shops, restaurants and restrooms. It also provides notifications on flight delays and its only limitation is that it does not offer negative reviews on the above-mentioned amenities, which means passengers must evaluate for themselves what users say about a specific feature. For iPhone and Android users, this app is free. It provides up-to-the-minute information about which lounge areas are nearby. It does this by processing information about individual memberships and itineraries. It also provides a place to post a review and photos of a particular lounge to inform (or in some cases, warn) fellow passengers seeking places to rest their weary legs in between flights. Expensive flourishes, warm personal exchanges and innovative designs all have their place in the unconscious formation of a user’s first impression of an airport restroom. However, ambient air-care masterfully applied by our experts carry it a few fragrant steps further by seamlessly imprinting the foundation for a loyal customer experience. We are industry leaders in ambient scent marketing and air care specialist services and we have clients all over the globe and across every industry under the sun. 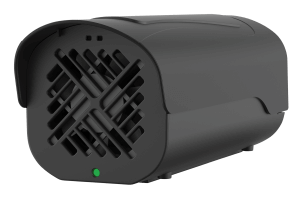 Our cutting edge technologies have developed odor control, state-of-the-art HVAC and Non-HVAC air freshening systems for every application and size requirement. In continuous operation for more than seventy years, our vast selection of premium aroma diffuser systems and 30 to 60-day air freshening refill products are the most effective found anywhere in the world, and with decades of laboratory refinements and on site experience, we’re fully equipped to permanently tackle any environmental odor or air freshening issue. The patented Aroma Beam diffuser, featured below, is perfect for large-scale airport restroom settings up to 50,000 cubic feet. Its efficiency is dependant on the unique cartridges that are customized for linear diffusion for up to 30 days. 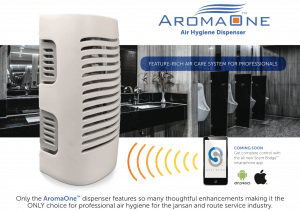 Other lines include but are not limited to: the Aroma Styler & Deco Roma Dispensers, the Aroma One Fan Air Freshener and Aeon & Rumate Passive Dispensers. Technology will continue to transform the landscape of the modern airport and those that have fallen behind are quickly picking up the high-tech slack of their competitors. Air-Scent too, and its many wonderful products, will continue to solve their environmental odor and air freshening issues for a long time to come. If you operate or manage an airport, don’t hesitate to give us a ring at the contact numbers listed below or send a written inquiry and we’ll get right back to you!